Anger: 4 FAQ’s – Abuse? Righteous? Boundaries? Counseling? This post is meant to offer guidance to common “What now?” questions that could emerge from Pastor J.D.’s sermon on Ephesians 4:27-32 addressing the emotion of anger preached at The Summit Church Saturday/Sunday August 25-26, 2018. In this post we will reflect on four frequently asked questions related to anger. What If Anger Is AT Me Instead of BY Me? If your struggle with anger is not self-control, but rather self-protection, here is a collection of resources on abuse which may be helpful. How Do I Know If My Anger is Righteous Anger? Anger declares actions wrong and / or people evil. Anger is a moral emotion because it makes moral declarations. Too often our anger is triggered by personal preference or mere selfishness. In order to be good or right, anger must be in agreement with God about the nature of what it condemns. Anger should address problems not attack people. Godly anger wants to see sin eliminated and sinners redeemed. If our personal anger degrades or harms another person it is wrong either because it is excessive or because it is personally addressing a matter that should be addressed by the church (Matt 18:15-17) or state (Rom 13:1-7). Sinful anger can be excessive in degree or duration. A long, slow burn is as wrong as a quick, hot flare (although the impact of each is different). While the saying “forgive and forget” is neither possible nor biblical, an offense that is harbored and replayed in one’s mind is bitterness (another flavor of sinful anger). One good measure for bitterness is how many details you remember about the offense. Anger can consume you without sinning against anyone else. Anger management techniques rooted in venting or catharsis, often encourage uncontrolled anger. God never “loses it” even in private. The more we use exhaustion-based techniques to squelch anger, the more we build the stamina and power of our anger (and the less we address the heart as the source of anger). We can be angry about the right thing in the right way for the wrong reason. Example: Rudeness in children is wrong. There are many forms of appropriate discipline. However, if our primary motive in disciplining our children is to prevent them from embarrassing us in public, then our anger is sinful. We have made our glory and peace the center of the world and emotionally forced it upon our children. 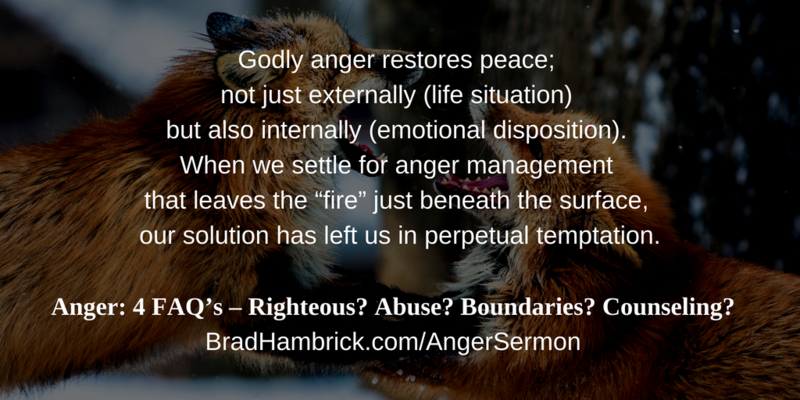 Godly anger restores peace; not just externally (life situation) but also internally (emotional disposition). When we settle for anger management that leaves the “fire” just beneath the surface, our solution has left us in perpetual temptation. It is also a good indicator we have only addressed the expression of anger and not the heart (beliefs, values, agendas) that fueled it. Godly anger restores the repentant. Godly anger genuinely wants peace more than vengeance. Do you want the offender to repent or pay? Do your words while angry point the other person towards God or focus upon you? Are you just concerned about whether God agrees with you (“I’ve got a verse that says I’m right”) or are you trying to represent God in that moment (2 Cor. 5:18-21)? What Are the Best Ways for Christians to Think about Boundaries? Christians have often struggled with how to think best about boundaries in broken relationships. Some use the word “boundaries” to communicate that Christians don’t have to be doormats because we want to model grace. Others resist the concept because they recognize that Christ crossed all boundaries to rescue us in our rebelliousness and believe Christians are called to model this same love to the lost world around us. Both seem to be making valid points. As we think about the impact that relating codependently has had on our lives, we are going to have to navigate this tension. Here are four principles to help us honor what is good in what both sides of this debate have to offer. A second principle when considering the concept of boundaries is that boundaries, when rightly communicated, are an invitation not a rejection. Thinking of boundaries this way will help you communicate your limits in a more receivable manner. When you are confident in what you will and will not do, pressure from others becomes less threatening. You can begin to say, “I will not [describe what is unhealthy in the moment], but I would be happy to [describe a healthy interaction alternative].” In this sense you are not “enforcing” the boundary (as if you were the boundary police), you are providing another opportunity to your loved one to choose wisdom over folly. A third principle is that “boundaries” can become an unhealthy concept when we use it to mean “walls” that make our relationships less authentic. This use of boundaries can come in the form of a “fake wall” when we are silent or deceitful or a “safe wall” when we are angry or fearful to keep people away. These uses of boundaries do not protect us from folly, but insulate us from authentic relationships; and serve as another example of coping mechanisms that serve well in dysfunctional relationships becoming disruptive to potentially healthy relationships. A final principle for using the term “boundaries” well is the ability to distinguish felt needs from real needs. Because boundaries are only needed in unsafe contexts, our instinct is to become increasingly self-centered when we think about boundaries. This doesn’t mean that felt needs are less real or unimportant. It means that we should use boundaries to protect our real needs from being damaged and, if someone is living in a way that frequently places them on the other side of these boundaries, we should not expect that person to meet our felt needs. Instead, we grieve the condition of this relationship and find ways, through God and healthy Christian relationships, to fulfill these legitimate desires. If my struggle with anger persists and I want to seek counseling, who would you recommend? G4 Group on Anger – This is a free, peer support group ministry at Summit that has groups for anger and many other life struggles.